The effort and attitude these players have put into their soccer and education over many years is a testament to everyone of them. It shows real determination and mental toughness to become a college athlete and all players showed be extremely proud of their achievements. As a club, we certainly are! Empire United Soccer Academy will continue to focus on helping and supporting the players who decide to continue the want to play in college. We are very proud as a club to have a very impressive alumni. Something that will keep growing every year. Next time you are at the Empire United Soccer Center make sure to check out our alumni wall. 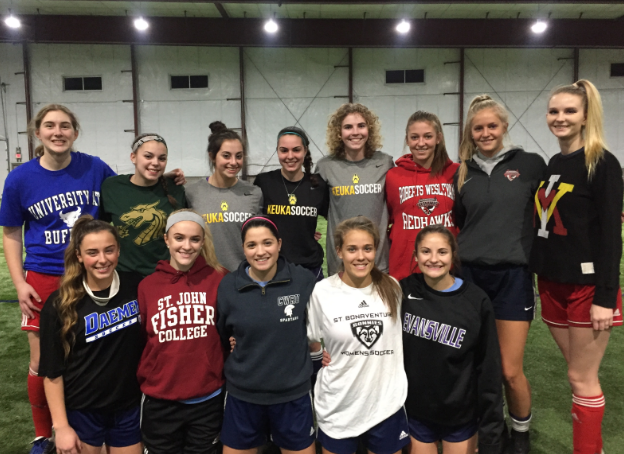 Above: Empire United Rochester 99/00 Girls showing their college commitments!